There’s more to fitness than lifting weights and gaining strength. Mobility is an essential part of any workout. Being mobile is a crucial aspect of being healthy. If we are not able to move a joint freely through its full range of motion, then we are putting ourselves at an increased risk of injury, before even attempting to pick up a weight and loading that range of motion. As we get older, we worry about joint pain because it will slow us down. But joint pain does not have to be a part of the aging process. With the right exercise plan, you can help say goodbye to joint pain. 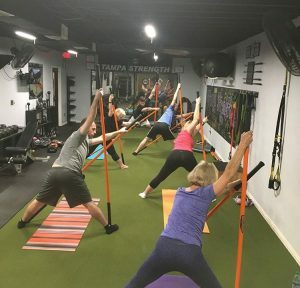 The trainers at Tampa Strength use an innovative training system to help their clients be more mobile. 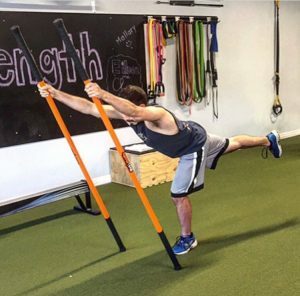 “Stick Mobility” helps clients improve their mobility, strength and overall fitness. The benefits of this type of training includes enhanced range of motion, improved muscle activation and accelerated injury rehab. Above all else this type of training is fun and can add a whole new dimension to the movements of any workout. These sticks serve as tools that provide leverage for extending your range of motion beyond what would ordinarily be accessible. Here are a few exercises, we find to be very beneficial at Tampa Strength. As you can see in the picture, adding a stick to the Dead Bug Exercise allows the user to increase their muscles’ time under tension, which can lead to improvements in core strength and makes the exercise much easier on your shoulder and lower back. Another great exercise is the Single Leg RDL. This exercise can help improve the strength and flexibility of your posterior chain and increase the muscle activation in your core and shoulders. The Dunphy Squat is the epitome of a total body exercise. 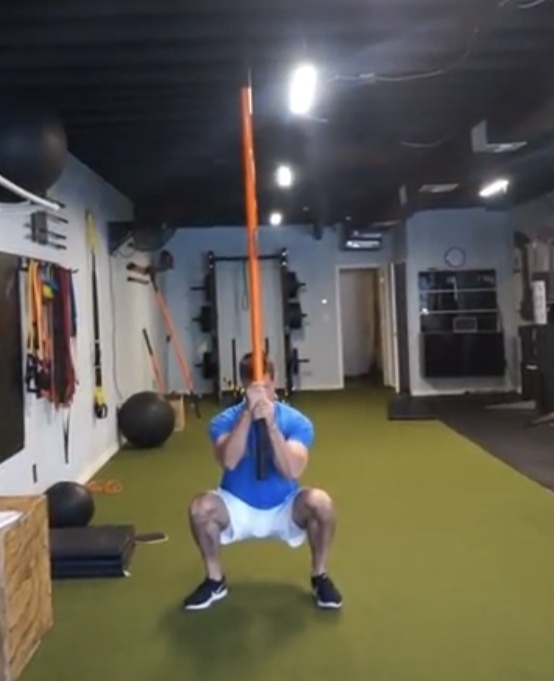 In addition to providing all the benefits of a standard body weight squat, it also creates a tremendous amount of muscle activation in the upper body. If you want to try these exercises, experience their benefits and much more, come check out our Mobility classes on Tuesday at 6:15 PM and Saturday at 10:30 AM or schedule a session with one of our certified trainers.